The planet earth is essentially a gigantic magnet. By exposing a smaller magnet to our planet’s natural magnetic pull, you can quickly and easily establish which direction is north-south. Together with your children or students, you can create your own compass with a few simple supplies. Just transform a paper clip into a compass needle, give it freedom to respond to the earth’s magnetic pull and watch it go. Unfold the paper clip. Straighten and lengthen the clip as much as possible. Grasp the refrigerator or bar magnet and gently rub it across the paper clip. Continue rubbing it for two to three minutes. Take hold of the packing peanut and pierce it with one end of the elongated paper clip. Push the paper clip through the foam until it emerges from the other side. Tug on the clip until the foam is centered between its two ends. Add water to the bowl and place the foam peanut gently on the surface of the water. If the peanut touches the bottom of the bowl, add more water until it rests on the water's surface and can rotate freely. Wait for a moment as the paper clip aligns itself with the earth’s magnetic fields. When the paper clip comes to a rest, it is pointing north-south. Confirm that your compass works. Blow gently on one end of the paper clip to push it out of alignment. 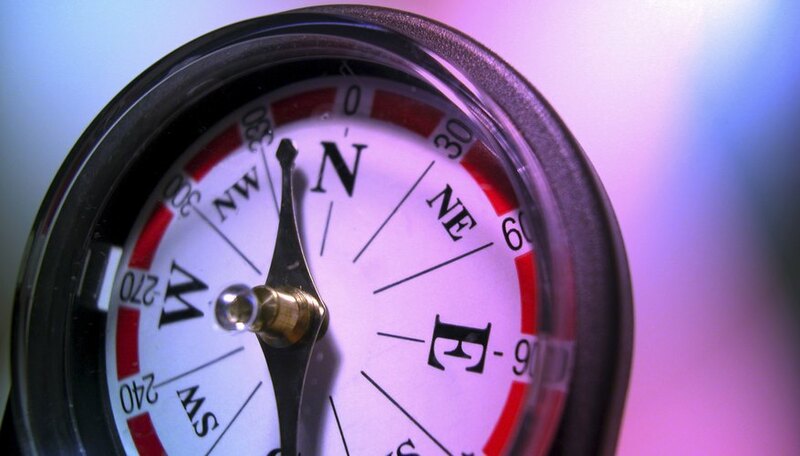 The compass "needle" should return and settle into its prior position after a moment or two. Use a real compass to help you determine which end of your paper clip is pointing north. Take a real compass in hand and stand at a distance from your paper clip compass. When your real compass indicates to you which direction is north, color the northern tip of your paper clip with permanent marker. How Would You Use a Meter to Check a Motor?